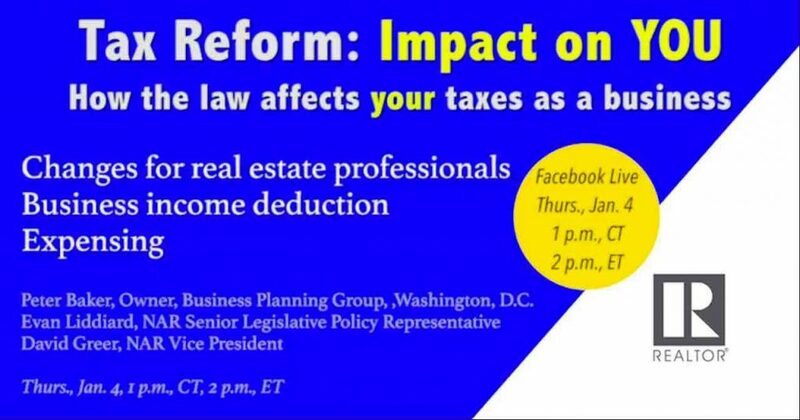 Click Here to Watch the Facebook LIVE Replay (43 minutes) on how YOU can benefit from the Business Income Deduction that was part of the Tax Reform Bill recently passed by Congress. While NAR remains concerned that the overall structure of the final bill diminishes the tax benefits of homeownership and will cause adverse impacts in some markets, the advocacy of NAR members, as well as consumers, helped NAR gain some important improvements throughout the legislative process. The final legislation will benefit many homeowners, homebuyers, real estate investors, and NAR members as a result. The final bill includes some big successes. Many changes reflected in the final bill were the result of the engagement of NAR and its members over the last several months and years. In fact, former CABR President and 2017 President of the Ohio Association of REALTORS® Pete Kopf was part of a contingent of REALTOR® members that met with members of Congress’ conference committee including Ohio’s Senator Rob Portman. In their meeting, Senator Portman committed to keeping the exclusion of gain on sale of a principal residence in the final bill, in addition to other issues important to NAR, our members and clients. NAR will continue to provide updates and guidance to members and work with Congress and the Administration to address additional concerns through future legislation and rulemaking. Lawmakers have signaled a desire to ‘fine tune’ elements of The Tax Cuts and Jobs Act as well as address additional tax provisions not included in this legislation in 2018, and REALTORS® will need to continue to be engaged in the process. * Keep in mind, the examples provided in NAR’s summary are for illustrative purposes only and based on preliminary readings of the final legislation. Individuals should consult a tax professional about their own personal situation.